The theme for CCP’s December 2017 Members Exhibit is Illumination. The accumulation and spread of human knowledge is deeply indebted to the labor of print and paper artists. It is their work, which allows concepts and ideas to be inscribed, transcribed and preserved into a physical manifestation. Printed materials were cherished objects and the artists who created them not only preserved their illuminating wisdom, but also shed their artistic light on the pages. Illumination originally meant specifically the addition of gold or silver painting but grew to mean any hand addition, marginalia, or embellishment added to the page. For Illumination, members will respond to these traditions and ideas; perhaps through telling a new story, by adding the illuminating light of metal leaf, jewel bright ink or an exploration of light. Frances Ashforth, 2016 Members Exhibit 1st prize winner, will have her Water + Words exhibition in the Lithography Studio. For eligibility, deadlines and entry information please download the prospectus. Image: Sunrise/Sunset, Karen Vogel, 2017, Monoprint. Karen Vogel, Sunrise/Sunset, 2017, Monoprint. 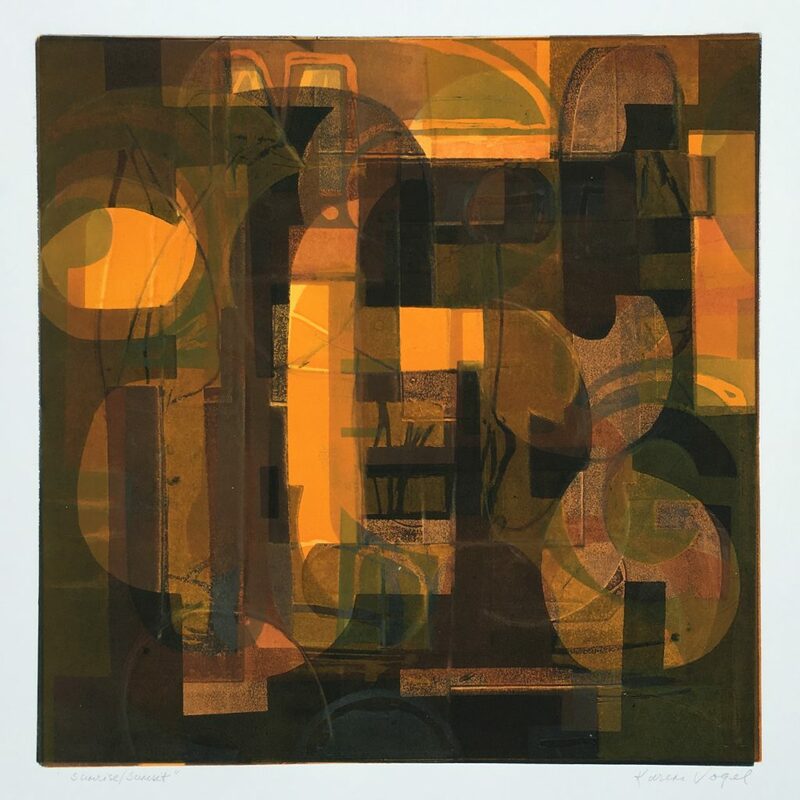 Jane Cooper, Illuminated Three Squared II, 2017, Monotype on Leaf. Betty Ball, White Tulips, 2016, Photopolymer Intaglio. Binnie Birstein, Halcyon, 2017, Screenprint with Encaustic. Katherine Draper, Alight, 2017, Monoprint. William Evertson, Flower Weaver, 2017, Moku Hanga.